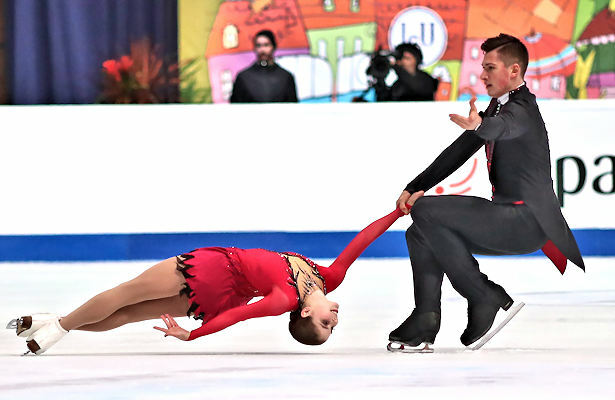 Anastasia Mishina and Aleksandr Galliamov perform their Free Skate at the 2019 World Junior Figure Skating Championships. The Russians swept the Pairs’ podium at the 2019 World Junior Figure Skating Championships on Thursday. Anastasia Mishina and Aleksandr Galliamov rose from third to capture the gold, while Apollinariia Panfilova and Dmitry Rylov won the silver in their debut at this event. Overnight leaders and defending silver medalists Polina Kostiukovich and Dmitrii Ialin slipped to third for the bronze. Mishina and Galliamov put out a technically difficult, yet confident routine to music from The Master and Margarita soundtrack. The only major mistake was a fall by Mishina on the side-by-side triple Salchow-Euler-triple Salchow combination. The 2018-19 Junior Grand Prix champions otherwise produced a level 3 triple twist, throw triple flip and triple Salchow, and side-by-side triple toes. The team earned a level 4 on all other elements and scored 121.72 for first place in the free skate and overall (188.74). “Being third in the short program pushed us to skate even with more emotions and cleaner to move up in the standings in this competition,” said Galliamov. The team works on choreography and dance several times a week in order to push their second mark, according to Galliamov. Panfilova and Rylov struggled with under-rotations on the side-by-side planned double Axel-Euler-double Salchow combination, but were otherwise clean. Their smooth and melodious routine to “Charms” from the W.E. soundtrack featured a strong level 3 triple twist, throw triple loop and triple flip. The 2018-19 Junior Grand Prix bronze medalists earned a new personal best of 120.26 for second-place finish in the free skate and overall (188.17). Overnight leaders Kostiukovich and Ialin finished third (113.28) in the free skate and overall (181.59). The 2018-19 Junior Grand Prix silver medalists also had under-rotations in their combination jump, and she took a fall on the throw triple Salchow. The team from St. Petersburg were otherwise clean in their routine, showing a level 3 triple twist, side-by-side triple toes, and a throw triple loop. Kostiukovich commented that each pair has their own character and shows emotions in their own way when it comes to artistry. “For us, in our program, we are wild animals and we try to show this, while other teams have more lyrical programs and lyrical interpretation and I think it is great there are so many different characters,” she said. Feiyao Tang and Yongchao Yang of China finished fourth with a new season’s best in the free skate (108.00) and maintained fourth overall (168.77) after their routine to “Feeling Good” by Michael Bublé. She fell on the side-by-side triple toes, but the team from Beijing landed side-by-side double Axel-double toes and a throw triple loop and Salchow. USA’s Sarah Feng and TJ Nyman moved up from sixth to fifth overall (162.90). The 2018 JGP Czech Skate silver medalists both popped a toeloop in a planned triple Salchow-double toe-double toe combination and she stepped out of the throw triple loop and Salchow, but they landed clean side-by-side triple toes. Teammates Laiken Lockley and Keenan Prochnow finished sixth overall (159.54) but managed a season’s best of 99.58 for their routine to music from the Cloud Atlas soundtrack. Hailey Kops and Artem Tsoglin of Israel placed seventh (144.88), followed by Ukrainians Sofiia Nesterova and Artem Darenskyi (140.88).